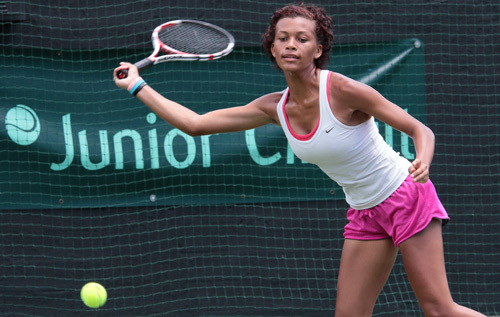 Tyler Smith is through to the semi-finals of the Bank of Bermuda ITF Junior Circuit Tournament after knocking out top seed Elysse Graci in a gruelling three-hour affair. Smith came off the court limping following a hard-fought final game that saw seven match points before Smith was able to win to close out a 6-2, 4-6, 6-3 victory. “She was playing really well, and I barely pulled it out. Those six or seven match points in the last game had me worried a bit,” Smith told the Bermuda Sun. Smith started the match well with a breezy 6-2 win in the first set that saw Graci forced into a number of uncharacteristic errors. Smith was able to match Graci’s power without much difficulty and looked to be running away with the game. The second set, however was a completely different story. Smith started by winning the first two games, but Graci’s power and experience began to show and she held the momentum for the rest of the game, with a visibly frustrated Smith nursing a sore right shoulder. The third set looked to be more of the same. Graci, still riding her momentum, powered her way to a 2-0 start, with both players fighting fatigue. Smith, however, had the home crowd behind her and began to mount a comeback that saw her tie it up at three all, before fighting through the final three games to win 6-3. Smith is through to the semi-finals with a head of steam after having knocked off the top seed in the tournament. “I guess it’s an upset,” seventh-seed Smith added. “I’ve seen her play and watched her a few times and we’ve played doubles so I know how she plays, but this is my first time playing her. I guess a lot of people were expecting a different outcome.